Are You a 5-Star Firm? Last week while sitting at a restaurant with my husband and two sons, we had an interesting conversation about how often we each check online reviews. While I am pretty diligent about checking reviews before buying products or visiting a business for the first time, I was surprised to hear how much value my family too places on consumer reviews. Even my 65-year old mother, scours online reviews before putting money down for a service or product. Stop and think about how often you search through Amazon reviews before making a purchase or how you skim through ratings on Google before selecting a business to click on. It reflects how second nature, and almost rote, that activity has become. And it is all tied to the ratings we see. Those 5 gold stars indeed stand out in a sea of 2 and 3-star ratings. We more often than not, bypass those lower ranking starred businesses and instead opt for the ones with 4 or more stars. Maybe occasionally stopping to read the 2 and 3-star reviews to see why they received those nails in a coffin rating. With so many review sites available at our fingertips, Yelp, Google, Facebook, TripAdvisor and Amazon, it is important to pay attention to what your clients and even prospective clients are saying about you. Although we often think about using these sites for selecting restaurants or buying items on our Amazon Prime account, service providers and even law firms are open for praise and scrutiny. As these sites have quickly become part of our regular searches, it is important to not underestimate the power of social proof or online reviews, even for law firms. According to YouGov, 78% of consumers in the U.S. read reviews before making a purchase decision. Their report also supports a previous study that found 87% of consumers trust online reviews as much as they trust friends and family testimonials. So how does your law firm stack up to other businesses in your area providing legal services? Will people needing your services stop at your listing or will they quickly jump to the firm with more stars? 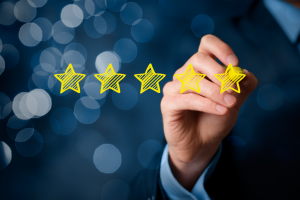 Here are 3 simple steps for enhancing your online ratings. Google It. It is important to know what is happening online and how your firm is stacking up with other law firms. Create Raving Fans. Set yourself up for success by intentionally creating happy clients. Is every interaction you have creating a future raving fan? Start by setting proper expectations and then work to exceed them. The end result will be clients who want to refer their friends and family to your firm. Ask for Reviews. Unhappy clients are often much more vocal than happy clients, so it is important to make a habit to ask your clients (at the end of each engagement) to share their experience online. Most will be more than happy to share. Interested in learning more about various review platforms? SearchEngineWatch reviewed the difference between Yelp, Google and Facebook reviews and which are most helpful to focus on.